Thanks for visiting the Success Unscrambled resources page where you will find a list of products and services that I use and/or trust for my business and yours. The list includes many helpful tools that will save you time and money with some them making you super efficient as a blogger and business owner. I have broken them down by category to make it easy for you to navigate and find what you need to get started. There are a number of resources that you can use to help you in the process of deciding to start your blog. They range from choosing your profitable niche to finding your blog name as well as getting a list of blog post idea to jump start your success. This is the resource will help you to find untapped niche markets. This blogging for beginners resource will really help you to get your head around the starting a blog conversation. 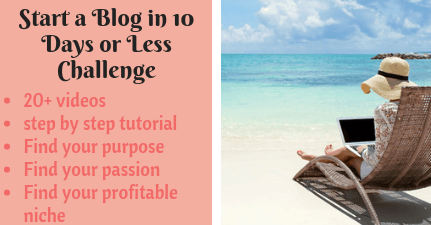 Once you have found your profitable niche and chosen your blog name as well as have a plan for your first 10-20 posts it is time to start a blog. If you are stuck and need a load of ideas on what to write for your blog topics then check out these 200+ blog post ideas. I have a free course of 20 videos available to help you start your blog in 10 days or less. Click on the image below to get started. Soon after starting your blog you will come to realise that there is so much to do when it comes to blogging. Here are a number of free helpful resources which you can use to avoid overwhelm. One of things you should consider doing is growing your email list from day one. I can tell you that it is the one thing I left too late in many instances. Here is a resource that will help you to compare the various email marketing providers out there. You are going to need to give away freebies to your subscribers so if you need help developing them using Canva then check out my template below. One the best ways to get visitors to your blog is by using Pinterest for business. If you already have a personal account you can convert it to a business account. Here is a list of amazing free resources to help you get started. After a few months of blogging and growing your traffic it is a good time to start implementing SEO into your blog. You can check out these free resources to help you understand all you need to know about SEO. After 6-12 months of blogging you may decide that you want to set goals or plan a strategy around your blog. Here is a list of thing that will help you make money blogging and achieve your long-term goals. I will leave it there for now although I can share a lot more tips and tricks to help you become successful and avoid unnecessary errors. Here is another template that you may find useful. Here is a time saving template that you can use.